Federal employees on Monday said that the partial government shutdown, which entered its third week over the weekend, is already impacting their finances, even though they are not due to miss a paycheck until later this week. “Nearly 100 percent of our GS 5-13s live paycheck to paycheck,” said David Norken, an American Federation of Government Employees worker at the Equal Employment Opportunity Commission. Nearly a dozen federal workers, all local union officials, spoke at a roundtable hosted by Sen. Chris Van Hollen, D-Md., to highlight the impact of the partial government shutdown on workers and to encourage Senate Majority Leader Mitch McConnell to schedule votes on two measures—one to approve a package of six full-year appropriations bills and another to extend Homeland Security Department funding until Feb. 8. Van Hollen has led a Democratic charge in recent days to block all votes on the Senate floor until McConnell holds votes on legislation to reopen the government. “Republican senators are ducking their constitutional responsibility to do their part to open the government,” he said. Anel Flores, president of the Goddard Engineers, Scientists and Technicians Association, a division of the International Federation of Professional and Technical Engineers, said the mere uncertainty caused by a government shutdown has an impact on NASA workers’ finances and morale. Tryshanda Moton, another IFPTE official at NASA, said that after 14 years as a federal contractor, she joined the agency for the security it was supposed to provide. And now that she has used much of her savings to pay down various debts, from credit cards to student loans, the shutdown may prevent her from securing a mortgage to buy a home. The uncertainty goes past major monthly bills, for furloughed and excepted workers alike. 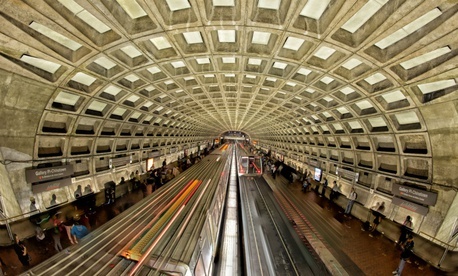 One employee noted that although excepted employees are required to work without pay, they have to pay out of pocket to use the Washington, D.C., Metro system, as transit benefits aren’t paid out during the shutdown. Johnny Zuglar, an AFGE official in the U.S. Census Bureau, said he has had to skimp on spending for his child’s upcoming birthday party because he doesn’t know when he will be paid again. Ashaki Johnson, president of AFGE Local 476, which represents employees at the Housing and Urban Development Department, said while the impacts on federal workers are real and important, people should not lose sight of the shutdown’s real-world effects on people who rely on agencies’ services.